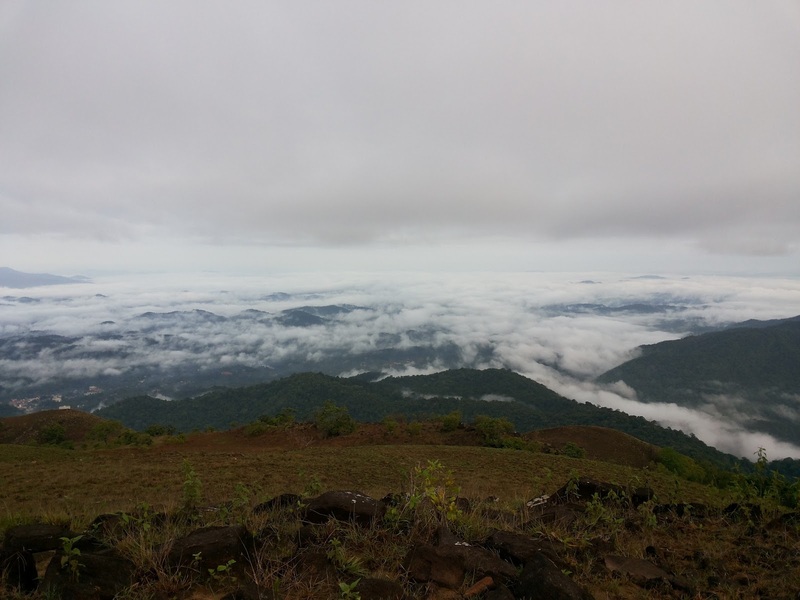 Kumara Parvatha [KP] was one of my most desired trekking place. Twice registered with Bangalore Ascenders (BASC), however luck did not turned up. Finally, I could complete my dream trek, with the same BASC. This time, event is organized by Raveendra. 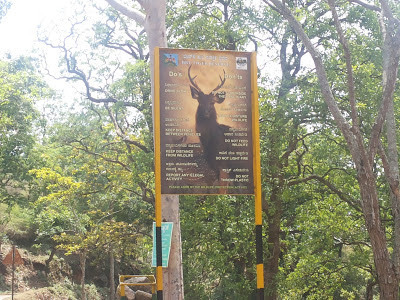 Earlier I had been with him in Dabbe Falls & Kanoor Kote trek, even though confirmed over phone to get short listed for this event. The trek name itself got attracted a lot ‘Full Moon Night Trek’, not making too delay, registered and waited for final participants list. 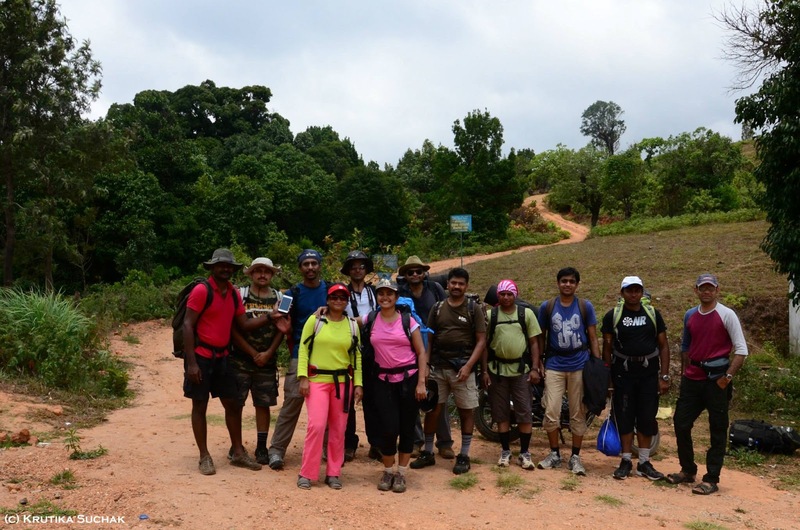 Full-moon turned as Monsoon Trek, thanks to Raveendra to giving an opportunity to be part of this event. 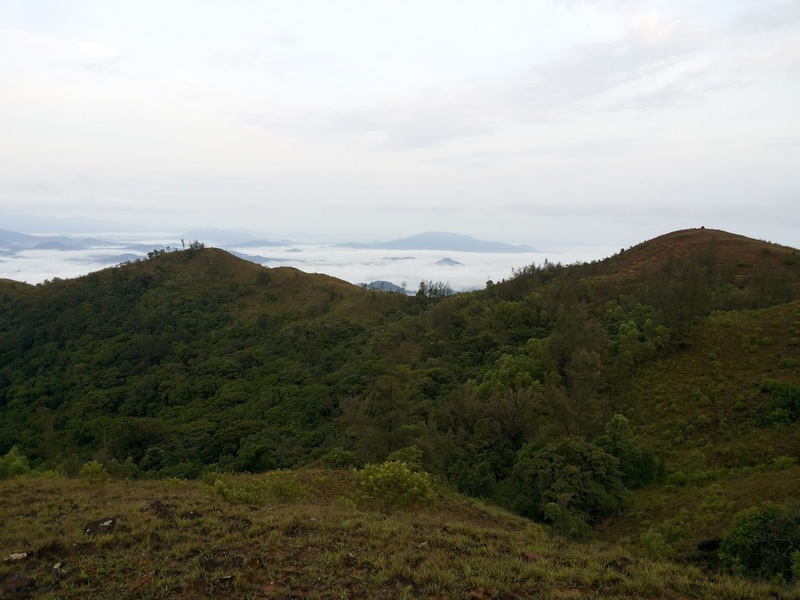 Kumara Parvatha (KP) is third highest peak in Karnataka. Its is known as "Trekker Paradise". I personally suggest to trek at least once in your life time. You can find more details about this heaven in different websites and blogs. 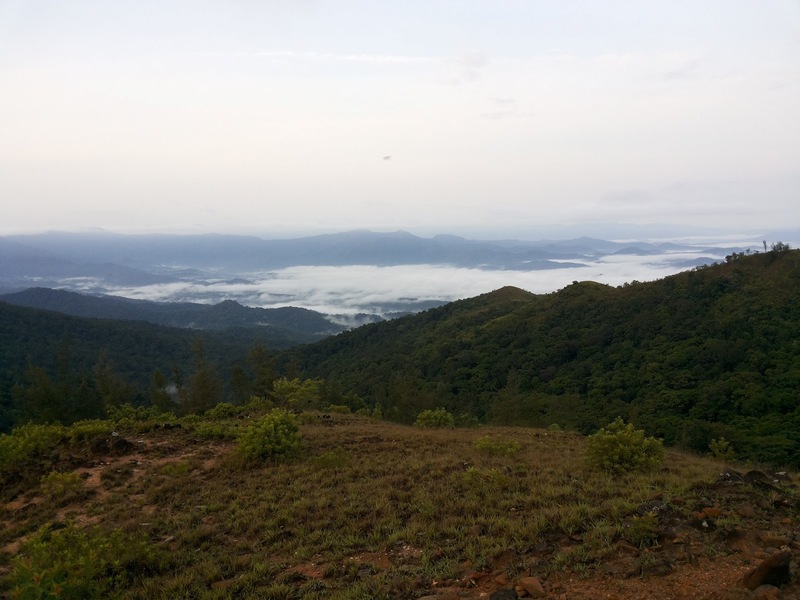 There are two routes to trek KP, one is from Kukkesubramanya to Kukkesubramanya and Somavarpete to Kukkesubramanya. Our trek was the second route, which start ascends from Bidehalli (27km away from Somavarapete) and descends at Kukkesubramanya. The overall route distance is around 20 – 22 kms. 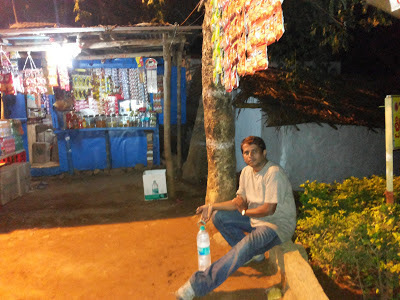 This time, I was little late, it scheduled 10.30 pm to assemble common point of BASC, Shanthala Silk House. When I reached the point, friends were busy to finish the indemnity bond formalities. All welcomed so warmly to me and said ‘guest is waiting to meet you’. I was quite surprise, and so happy to meet one of the BASC active organizer Pallavi Ranganath. Never expected, I could meet her within this short time. In fact, I was eager to meet this dynamic personality. I would like to mention few words about her, am great fan of her blog. 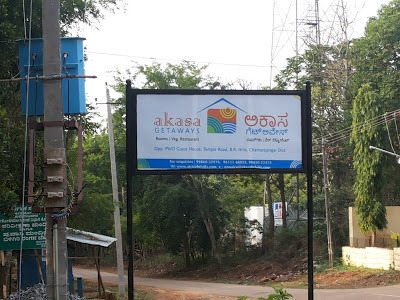 Using common conversation words, she present so effective write-up Kannada blog. Thanked her and adieu to meet again. Left the Bangalore at 10.50 pm by 13 seater Tempo Traveler (TT). Introduction part took along the journey. 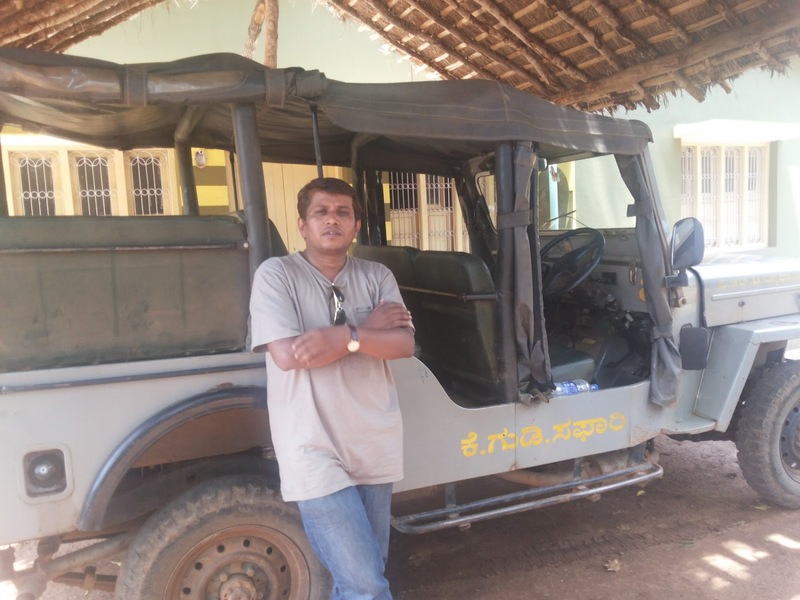 Raveendra explained the blue print of the trek. Bengaluru – Somavarapete – Mallahalli Falls – Bidahalli – KP Peak – Bhattaramane (Gaddemane) night halt – Kukke Sumbramanyam – Bengaluru. 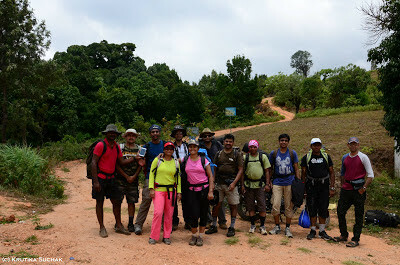 The team size was 12 pax, few of them were my previous trek friends. Team members are Raveendra, Sreeharsha, Govind, Rajdeep, Shanti Prasad, Krutika, Saujanya, Dinesh, Somashekhar, Ashutosh, Naveenkumar and myself. 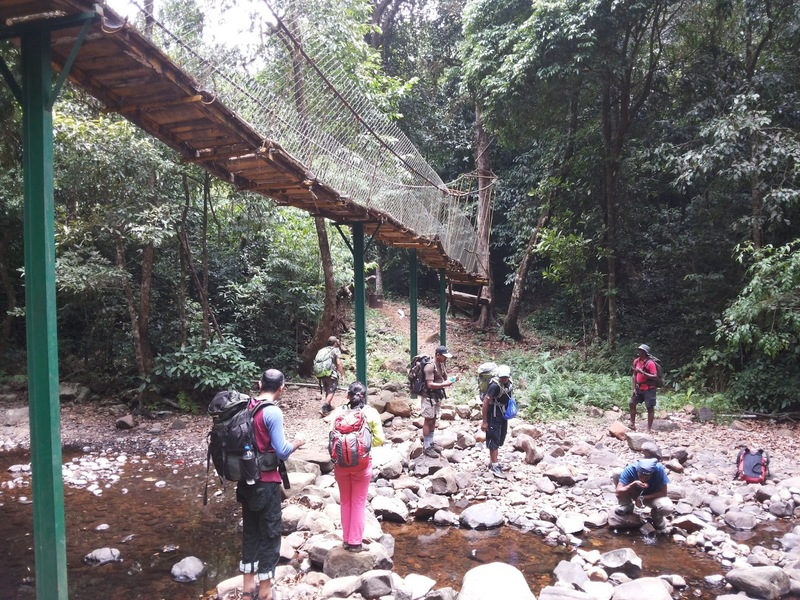 Everyone shared their previous trek experiences. I felt again, all are most senior and serious trekkers. 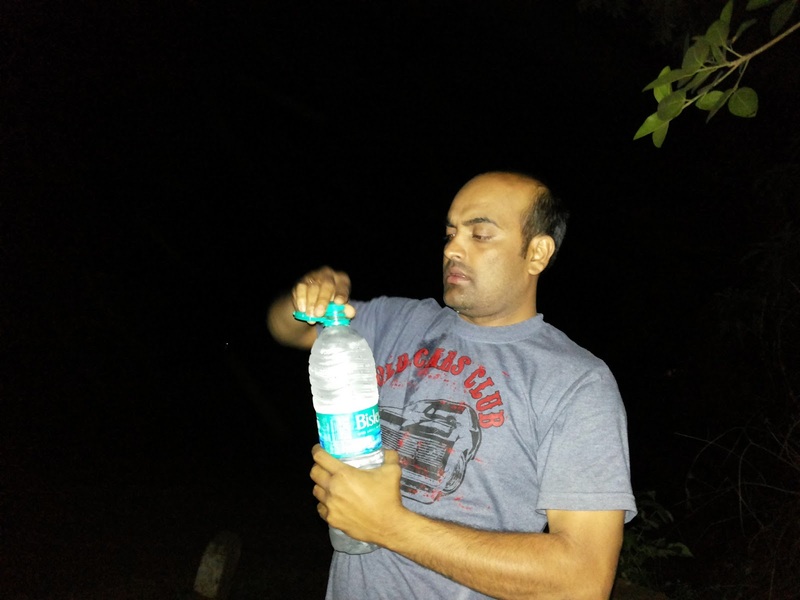 Reached around 1.15 am to Srirangapattana, pit stop get refresh with hot tea. Now the time to nap few hours, said good night to everyone. Reached Somavarapete so early at 4.15 am. The town was in deep sleep. We have to kill another 3 hours time. Searched a good place where we can relax for some time. 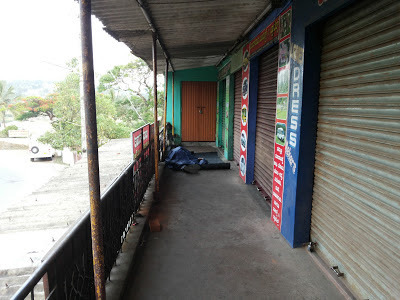 At last, we found a complex area where, at least 7-8 people can sleep. 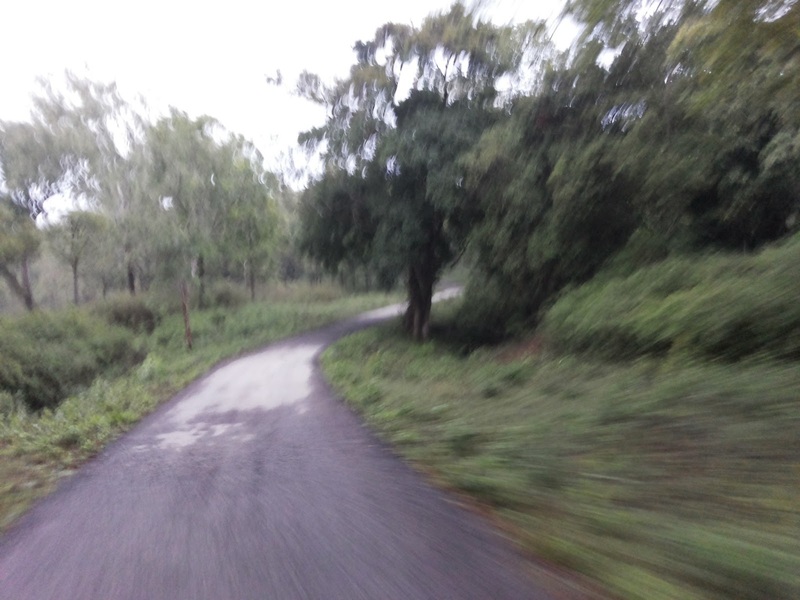 Due to heavy cold, none of came out from TT except myself, Govind and Shantiprasad. 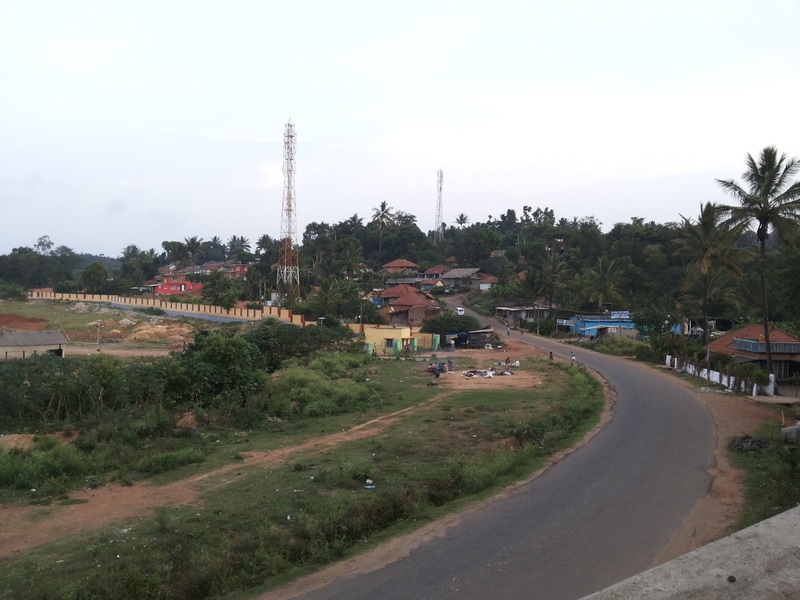 I too struggled lot to sleep but did not get, finally decided to roam around Somavarapete in cold morning. 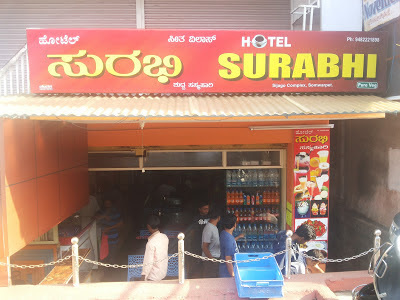 Finished our morning duties at Public toilet and had tasty breakfast at Surabhi Hotel, Somavarapete. We wanted to carry parcel for lunch, but hotel guys denied to prepare now itself in the morning. 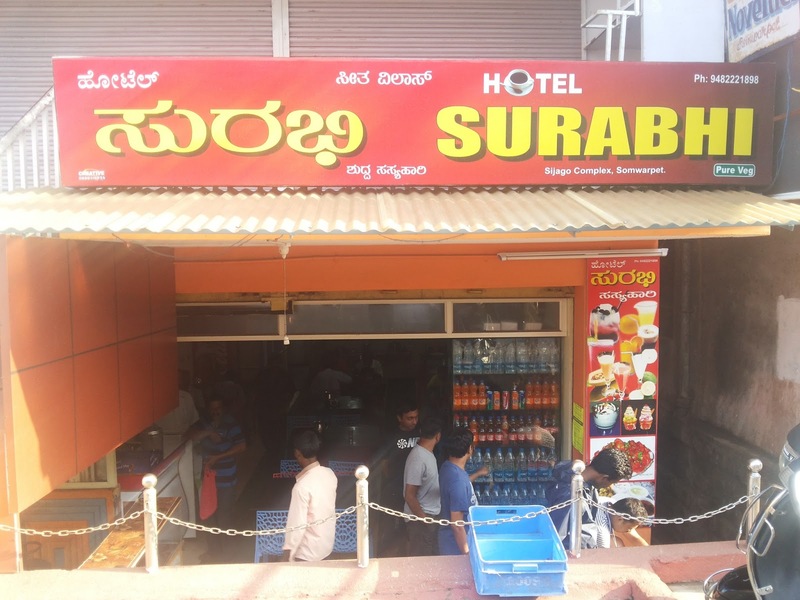 Local people were suggested to try our luck one of the Hotel, which is very close to Mallahalli Falls. 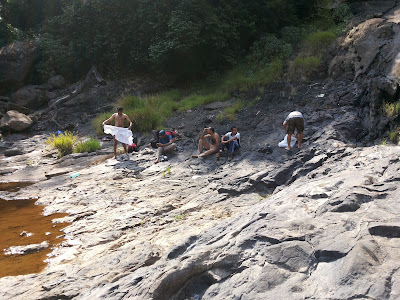 Reached the Mallahalli falls at 8.45 am. 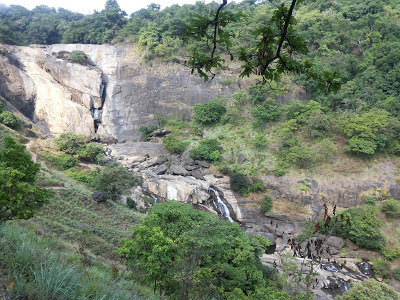 To reach the base of the falls need to step down around 1 – 1.5 km. 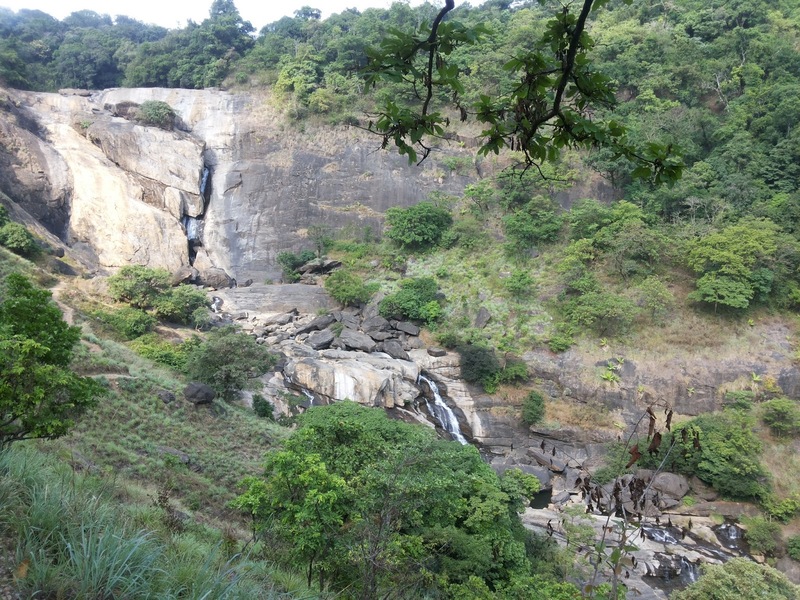 The beauty of the falls can be enjoyed in the Monsoon. Considering the summer and hot, still we dipped into the water and relaxed for some time. While going to the falls, ordered the lunch at Hotel. We have forced to take the lunch at 11.00 am, since the hotel person did not have packing material for parcel. We all had tasty lunch which contained Rice, Sambar, Rasam, Paapad, Pickle, Curd, Mangoes, Banana. Really it’s so worth and tasty food. 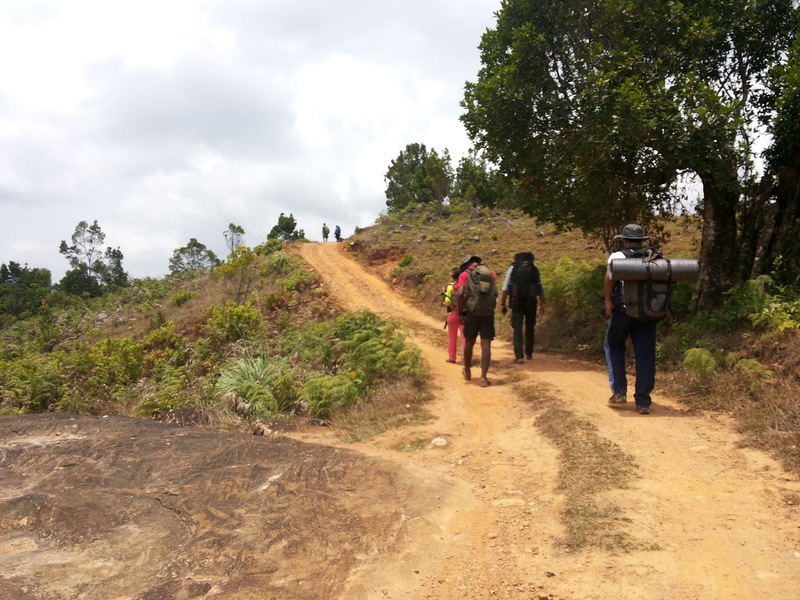 Now our real trek begin, reached the Bidahalli, base point of the trek around 12 noon. The sun was hot and there was no sign of rain. Everyone got prepared for expedition of KP. 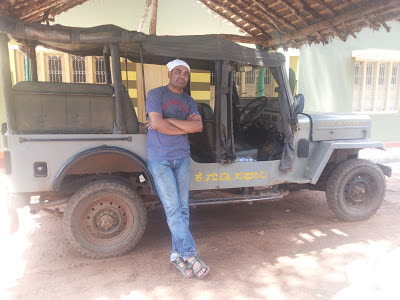 After 15-20 minutes walk on jeep mud track, reached the Forest Check Post. 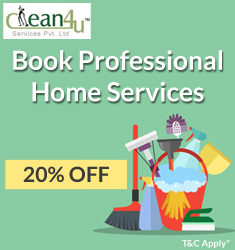 Everyone has to sign on their formalities documents before proceeding further and also has to pay the fees. Very soon, we have finished the documentation and continued our journey. The thick forest starts from this point. We crossed the small stream while filled the empty bottles. Initial trail was cool, the real adventurous path started after half an hour trail. First time in my life, encountered with leeches. Oh My God!!!! it leaches world. We never expected this volume. 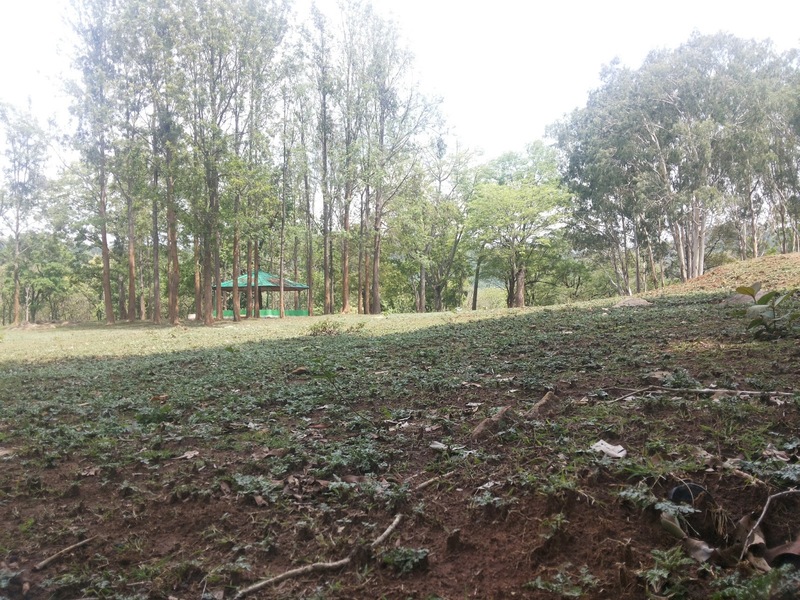 The forest officials were told that ‘there are no leeches’ but the fact was opposite. There was no chance to stop and proceed, plenty of leeches were attacking from all the sides. I was scared and tiered a lot. The heavy lunch made me more tiered. 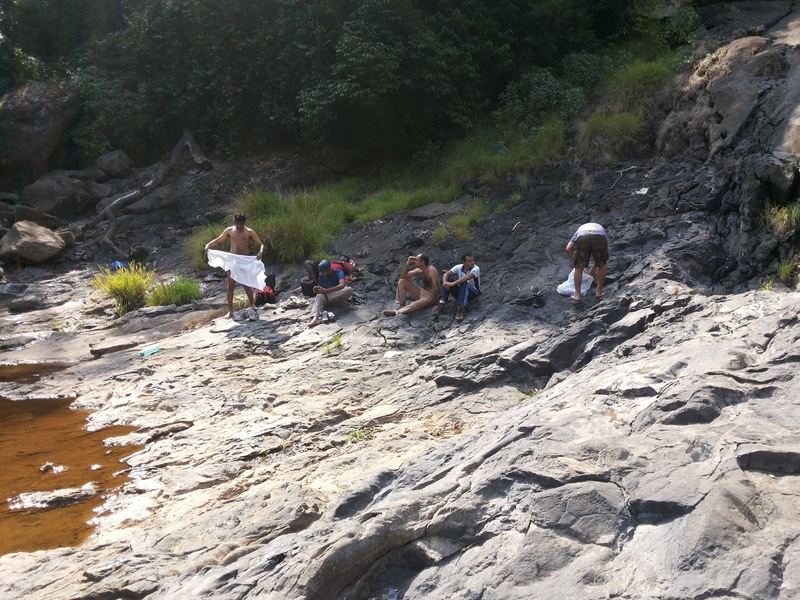 Leeches attack continued to all except Dinesh & Govind. Am surprised to see Dinesh & Somashekhar were wearing the Sandals and were so comfortable. After continuous 2 hours steep ascend, reached the safe place, where we checked our shoes for leaches. Few leeches were gone inside the shoes and trying to find their food of blood. Luckily, I could kick out them before making their food of blood. I would like special thanks to Govind who was motivating me and helping a lot to push hard the trail. Now we entered totally into a different world, we all in clouds. 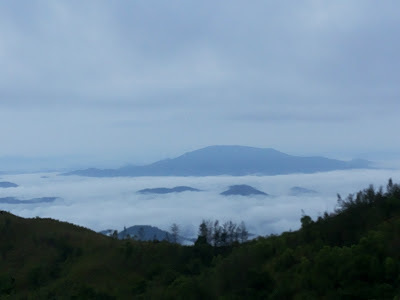 What an amazing, the clouds are passing us and we felt so cool and beautiful environment. Now the climate turned again so romantic and beautiful. Rain started and we were completely in cloud. We have to pass two big rocks which are almost 45 -50 degree angle. Luckily we passed this stretch before rain starts. Reached the KP peak around 3.30 pm. Mountain was covered completely with mist, the entire range is poor visible, we could not able to see anything beyond 3 feet of distance. We had a good time on the peak with snacks. Took many group photographs and relaxed for some time. The wind was hitting more fast and situation getting worse. Govind suggested, before weather getting worse, we need to reach safe place. It was highly impossible to get full moon in today's weather, and very difficult to walk in the night. 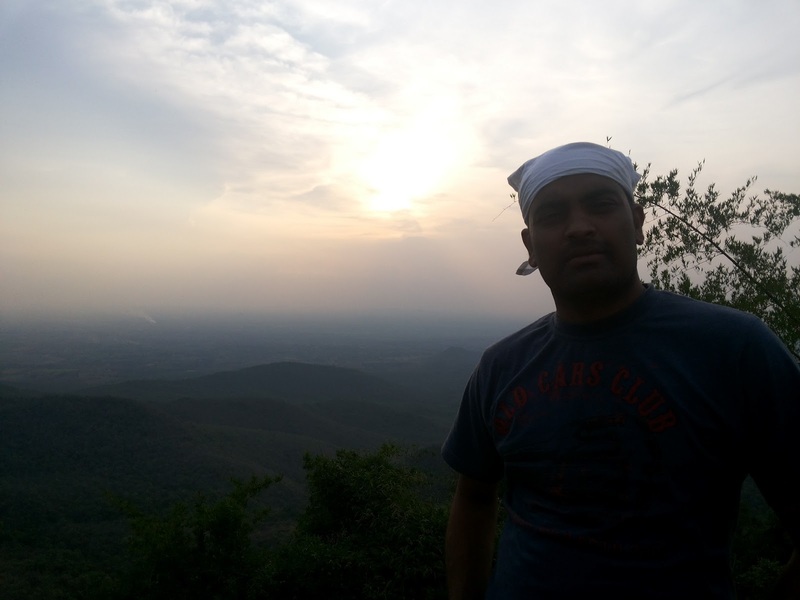 Raveendra taken opinion of all the friends, unanimously decided to descend towards Bhattaramane. The descend was too difficult, we need to be very careful. From KP peak, we have to cross thick forest to reach Sheshaparvatha. Leeches were again ready to attack on us. There was no option except running till the safe place. After reaching the Sheshaparvatha everyone checked their shoes and bags about the leeches. 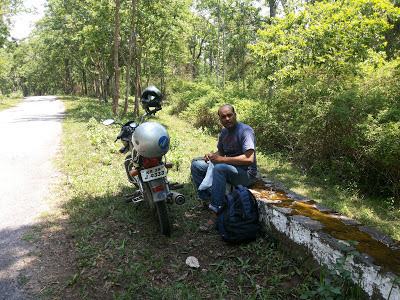 Relaxed for some time and continued our journey towards Bhattaramane. Now the drizzling becomes heavy rain. Moonlight trek become monsoon trek. 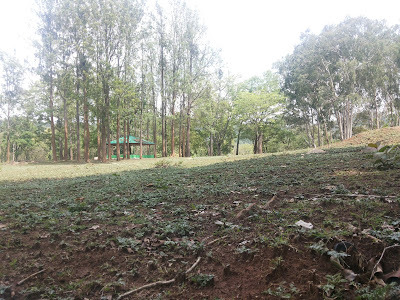 Everyone enjoyed the nature and moved towards Kallumantapa. Due to mist and rain, we can see only the clouds. The rain was not ready take a break, it was on his job. 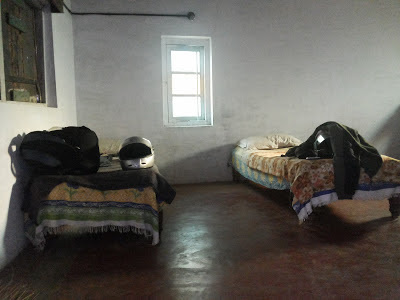 There was no place to relax at the Kallumantap, our journey was continued. The task is to reach Bhattaramane before getting the weather worst. Reached the Bhattaramane around 7 pm. 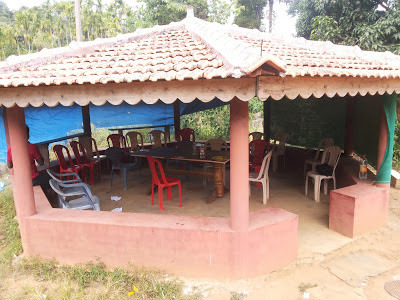 Before we all reach to this point, Shanthi Prasad organized hot soup for all. The dinner was ready, had delicious food and said good bye so early. Whole night the rain was poured heavily. Myself, Shanthi Prasad and Rajdeep got up early went to see the beauty of the nature. Yesterday we could not able to see the more beauty of KP. 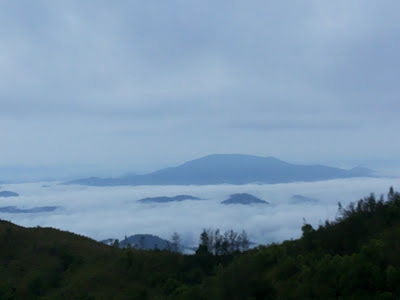 The whole area was bed of clouds. 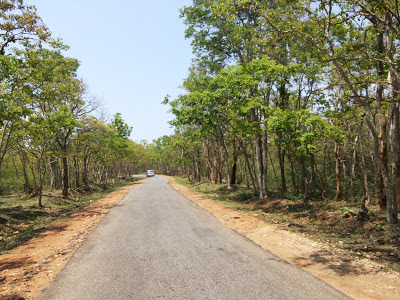 Took many photographs and reached back to Bhattaramane. Upama, the morning breakfast was ready. 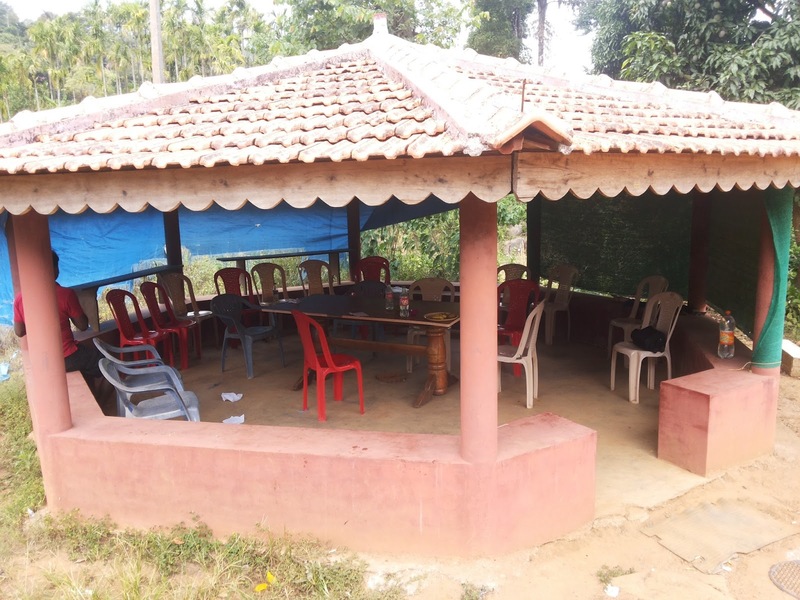 Finished the breakfast and got ready to leave Kukkesubramanya. The distance was only just 6 km descend. 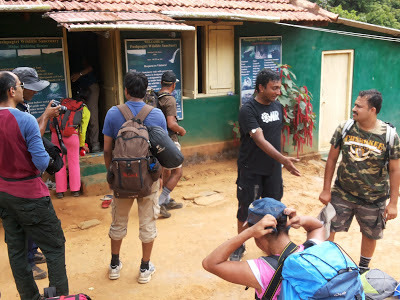 Left the Bhattaramane at 8.30 am, now we all were prepared to chase the leeches. Understood from Bhattaru, this route contains less leeches compare to our yesterday route. However, today I got little courage to chase them. The journey was completely descend. 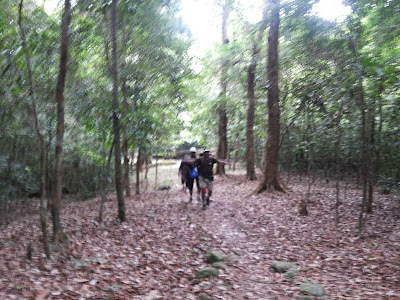 After reaching the thick forest, again the leeches were on action. The strategy is same, need to run and run until we get safe place. 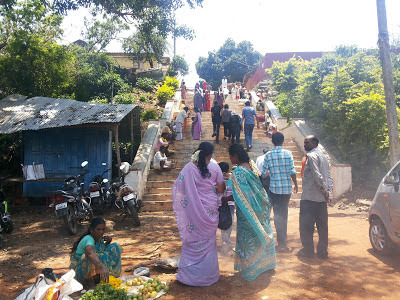 Luckily I could escape and at last reached the Kukkesubramanya at 11 am. As usual Shanthi Prasad ahead from all of us and myself, Sreeharsha, Ashutosh, Rajdeep followed him. Everyone reached Kukkesubramanya at 11.30 am. Went to Kumaradhara for holy dip. Few of us wanted to spend more time in river and other went to temple for darshan. The temple was more crowded due to full moon day. Finished darshan and lunch and left to Bangalore at 2.30 pm. The return journey was also more interesting. We all went deep sleep little. After short refreshment of sleep, the team was more powerful than earlier. We had good songs mela, till reach to Nelamangala. Govind and Somashekhar have awesome songs bhandaar. These guys are rocked in whole journey with different mood songs. 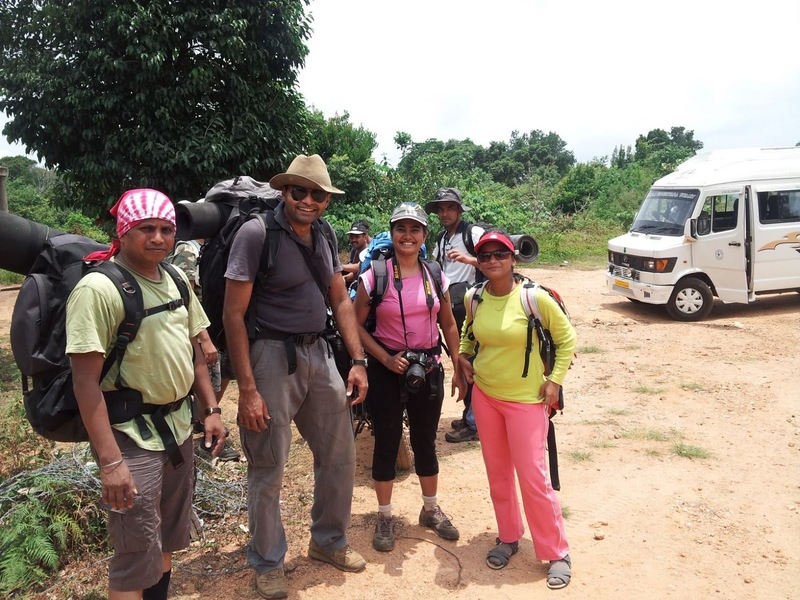 By reaching Bangalore the time was 9.30 pm everyone said good bye and hope to meet in next trek. The whole team was so fit, strong and very friendly. The whole trek was so humorous and laughed since beginning to end. Hats up to Dinesh, who has always sense of humor. 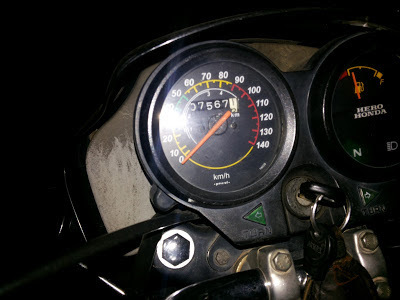 After three years gap once again the time to go on Bike trip to a long ride around Veerappan territory Chamarajnagar District. 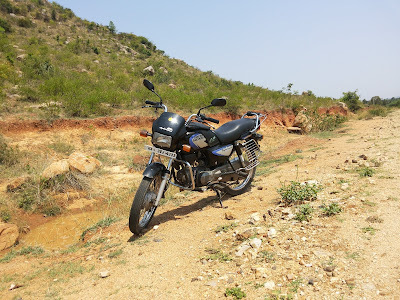 Since long time I wanted to go solo trip on my Splendor+ , however my always companion to most of the trip & trek Sudhakar joined me at last moment. 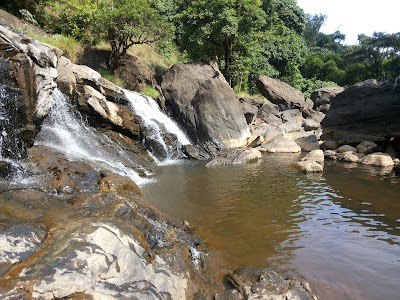 You can get detailed information about any places through various website, my main objective of the blog is to share my experiences throughout the journey/trek. Initially my friend was not comfortable on my Splendor+; he wanted to travel on Pulsar. My decision was clear and succeed to convince him. We finalized our route map and decided to leave early morning on 11.05.2013. Yesterday night I could not able to sleep properly. Mobile alarm rang up at 4.15 am., got up and get ready by 5.15 am. Called Sudhakar and informed about my leaving whom I need to pickup from HMT Layout. Left the home at 5.30 am and reached to his place at 6.15am. Had hot tea at his home and left at 7.30 am. 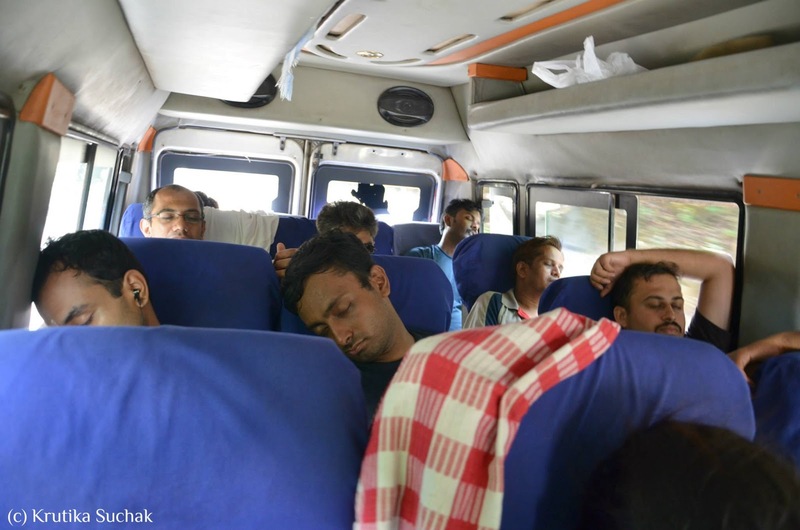 Mysore highway was busy with weekend traveler vehicles. 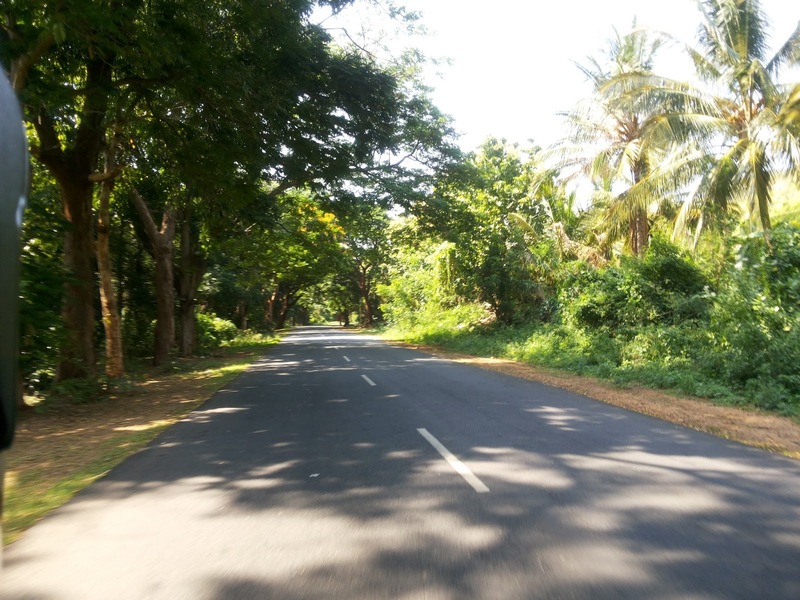 The journey was pleasant and reached Maddur around 9.00 am. 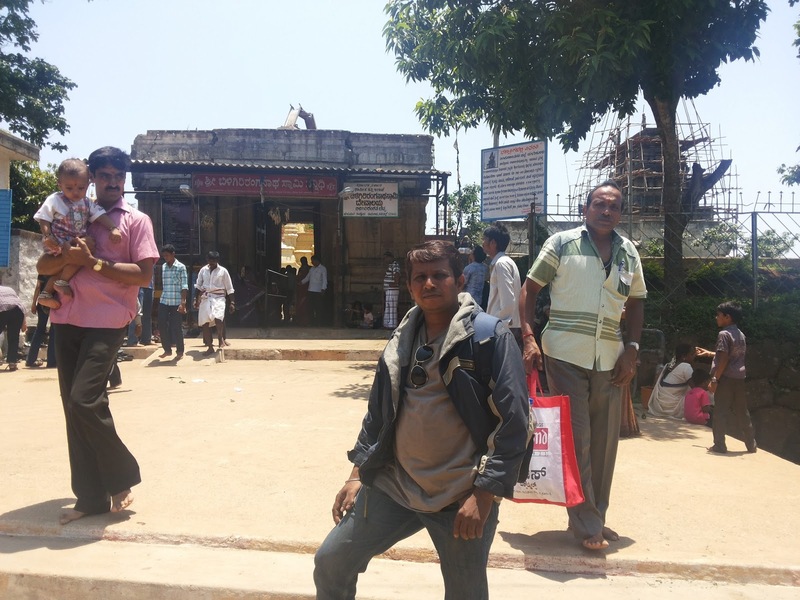 Decided to have breakfast and take a small break at Maddur. Morning was cool and not felt so tiered. We had breakfast at road side hotel Poori and coffee. 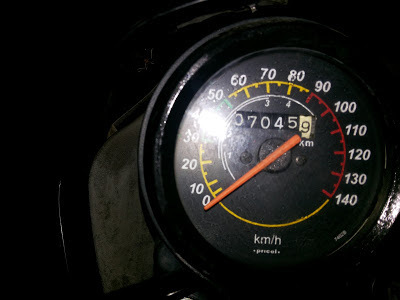 Maddur to Malawalli road was horrible and very difficult to ride two wheeler. 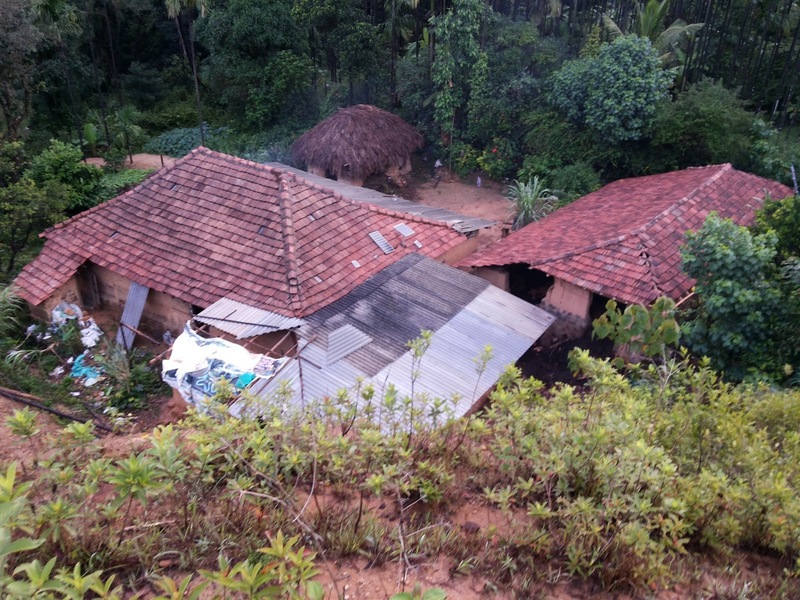 The road was looking like a earthquake area where we need to struggle to find good portion part on the road. The 30 km journey took almost one hour and at last we reached a good road. 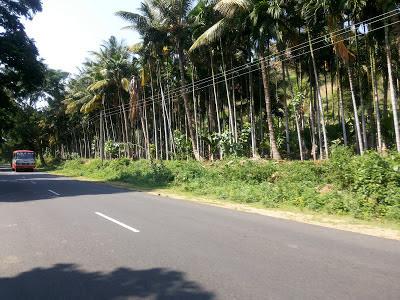 Malavalli to Kollegala road is excellent. It’s a single road but you can enjoy the ride. 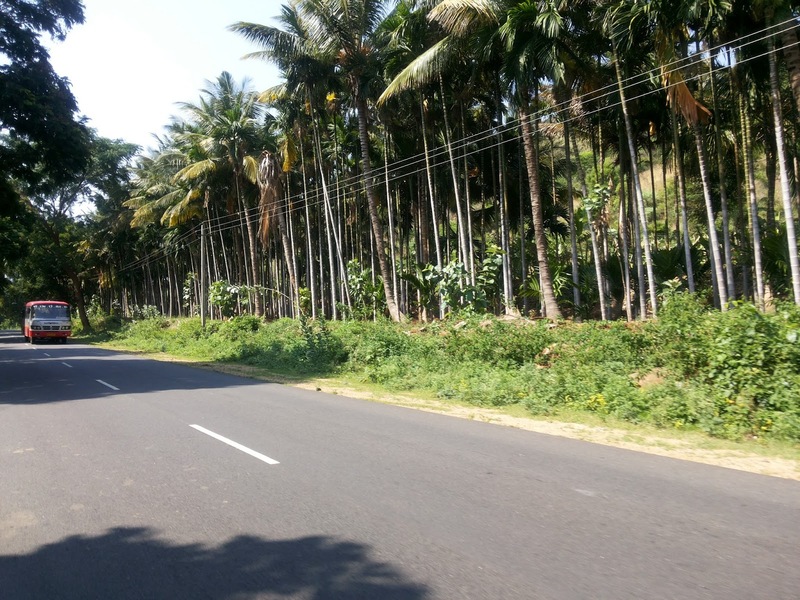 The greenery paddy fields, open grass land gives you pleasant of journey. Reached Kollegala around 11 am and proceeded towards Biligiri Rangana Betta. 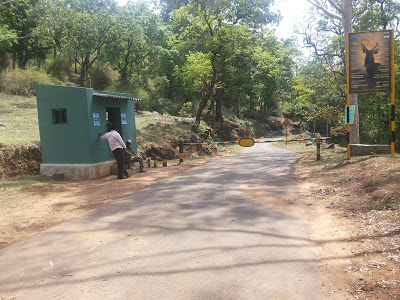 From Kollegala to BR Hills is around 30 km and its again single road. 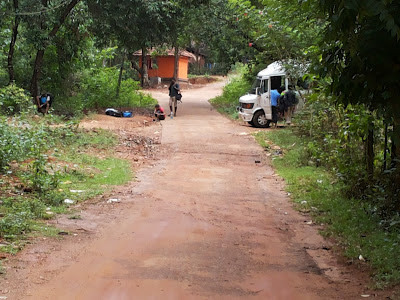 Pass through many small villages narrow road and reached to Forest Check Post. The entry into BR Hills is allowed between 7 am to 6 pm. The main forest gets start from this point. 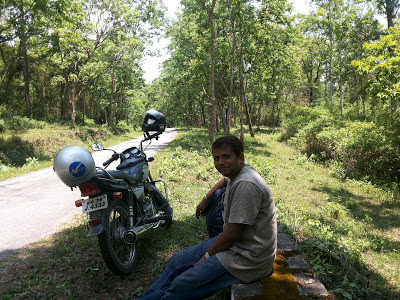 Splender struggled little to ride double on this hilly road however we could able to reach BR Hills at 12 Noon. 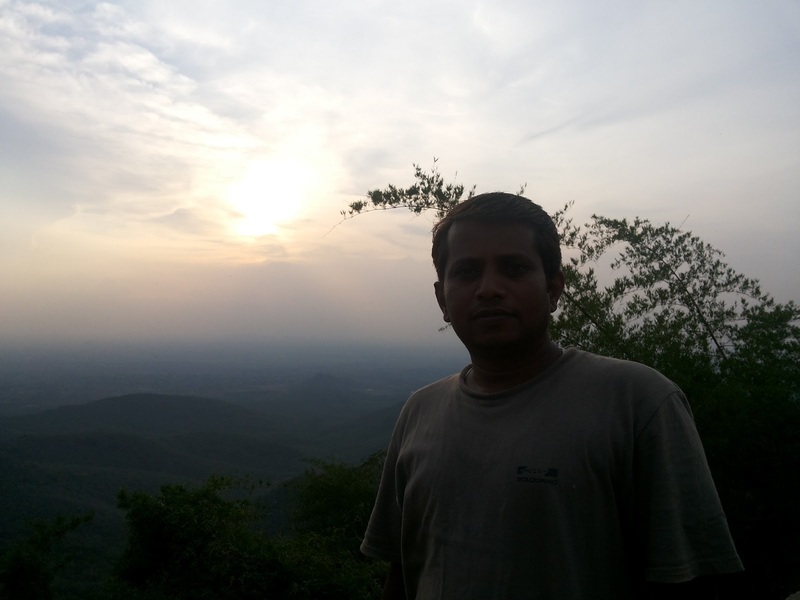 Almost 7 years back once I visited this place. There is lot of changes around the temple. The crowd was more and understood that, last week annual car festival took place. 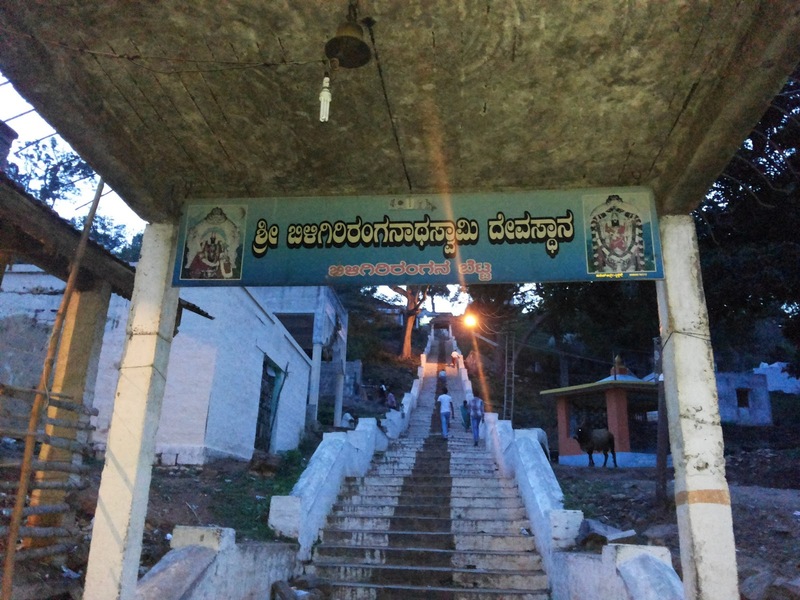 Had darshan of Ranganath Swamy and relaxed some time in temple premises. We are become a good friend to one of small shop keeper who guided us around the places. 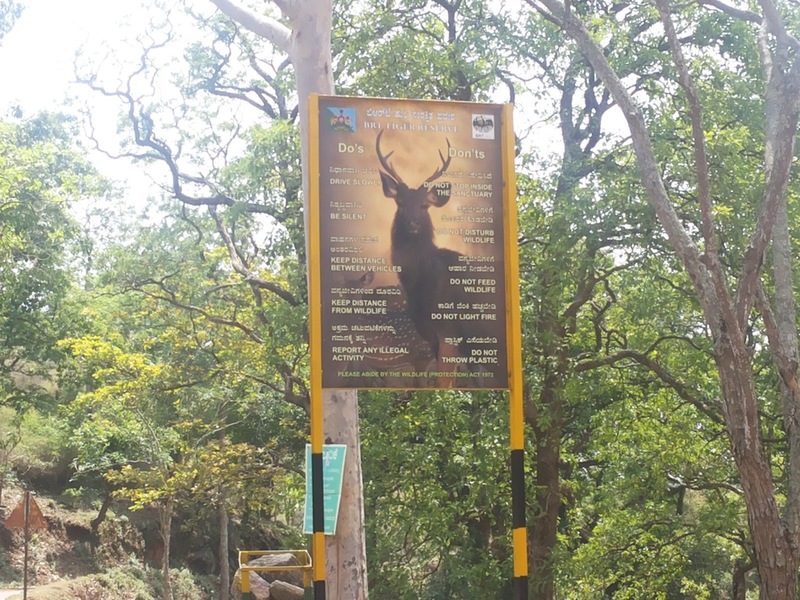 He suggested to go K Gudi which is around 20KM away from BR Hills and can enjoy the forest ride and safari. 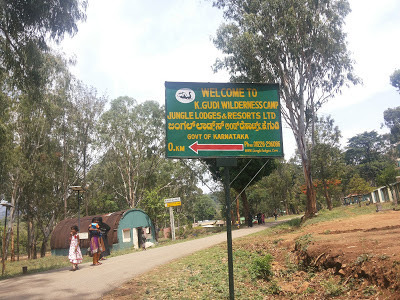 We left the next destination to K Gudi. Really the forest is awesome greenery. 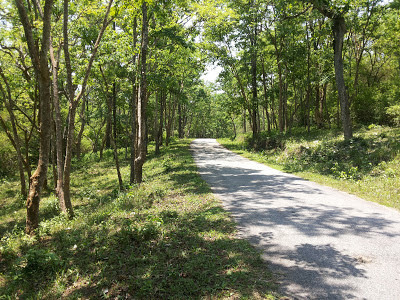 In the mid of summer you can find a thick green forest. We enjoyed the ride and Sudhakar brought Roti from his home and had in the middle of forest and relaxed some time. 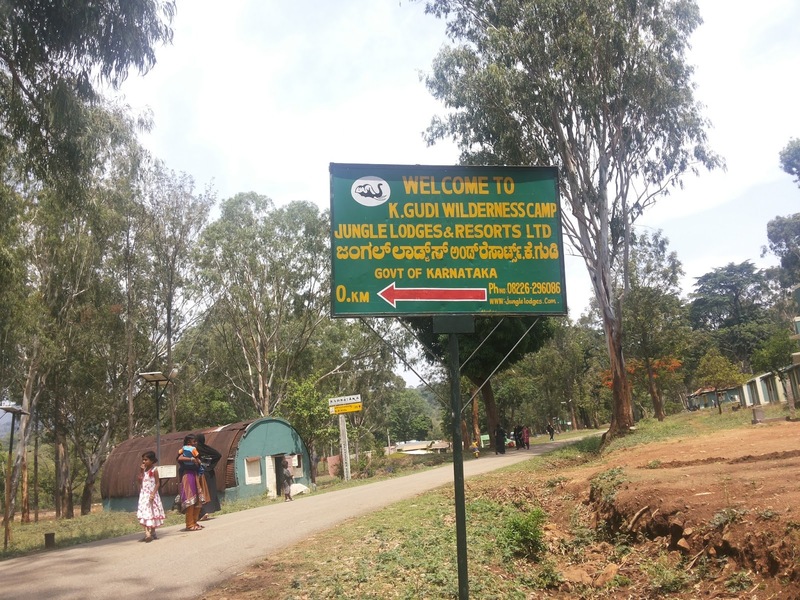 Reached K Gudi around 1.30 pm and enquire about the Safari. The Forest Ranger Officer assured us that, the safari begin at 4pm. 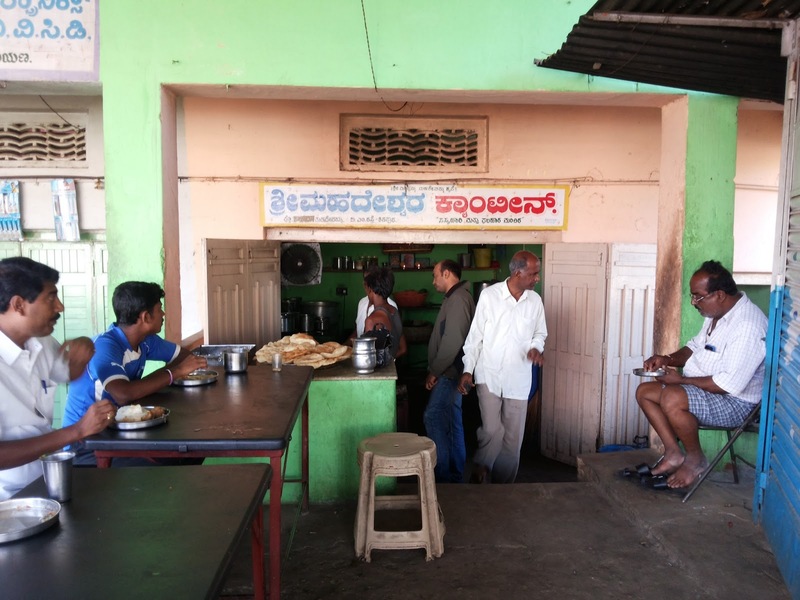 We had no option to wait another 2 ½ hours at K Gudi. Other people too were waiting for the Safari. Just roam around the camp and the place is really very beautiful. Jungle Lodge & Resort run a resort and apart from this you can find forest department quarters. Nothing is there to get anything. Beware! get loaded everything before reaching that place. 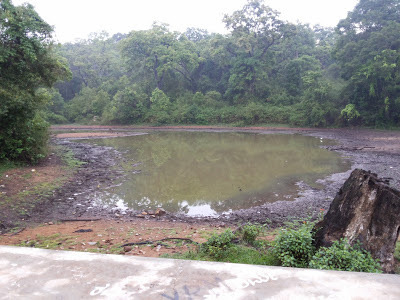 Most disappoint moment fact is, after 4pm also not even single forest officials turned up for Safari arrangements. You can find a big building named as 'Information Centre', unfortunate that, you will not find anyone to give information. 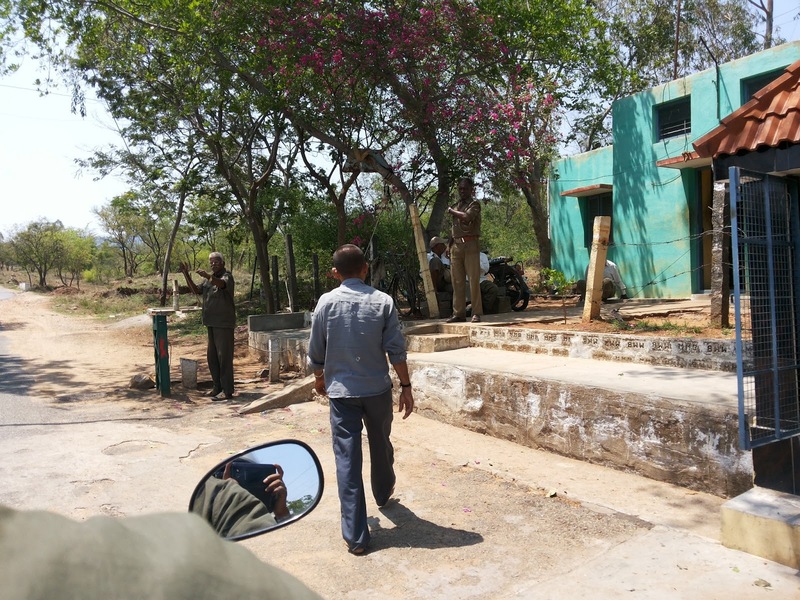 After inquiring with guards understand that, there are only 3 jeeps which use for public safari. Due to some higher official visit, all vehicles are booked hence no arrangements for aam public. With painful heart returned back to BR Hills. We have to make arrangements for night stay. We were hungry very badly, the time was almost 5.30pm. Luckily we got tasty Rice & Sambar (ofcourse it was not hot). at Akas Getaways Hotel. 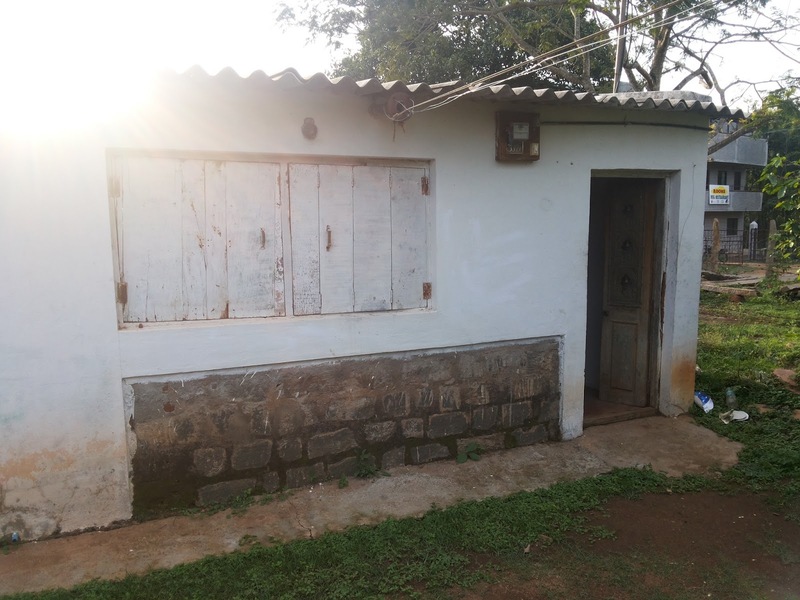 Enquired about room and it was full. Somewhat the same hotel manager arranged a small old out house for night out. Due to weekend all hotels were house full. Most of the hotels hire on package trip basis. 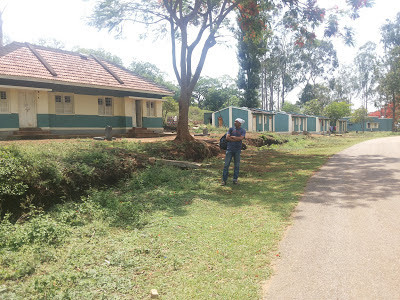 Charge from 1200 to 2500 per person which include stay, food, outing and safari. We are happy that he arranged it for Rs.500/-. Dumped our bag and freshened up and relaxed some time. Reached back to shop wala and asked him the place to spend the evening time. Went to sunset point and chitchat almost two hours and spent memorable evening. And also suggested us to go early morning safari on our own bike towards K Gudi forest and if luck, can view wild animals which we missed in the K Gudi. Had dinner at 9.00 pm and reached our heaven to rest for the night. The whole night was good rain. Woke up at 5am and finished our morning duties. As suggested left 6.30 am to K Gudi road. The K Gudi road connect to Chamaraj nagar which operate morning 7 am to 6pm. 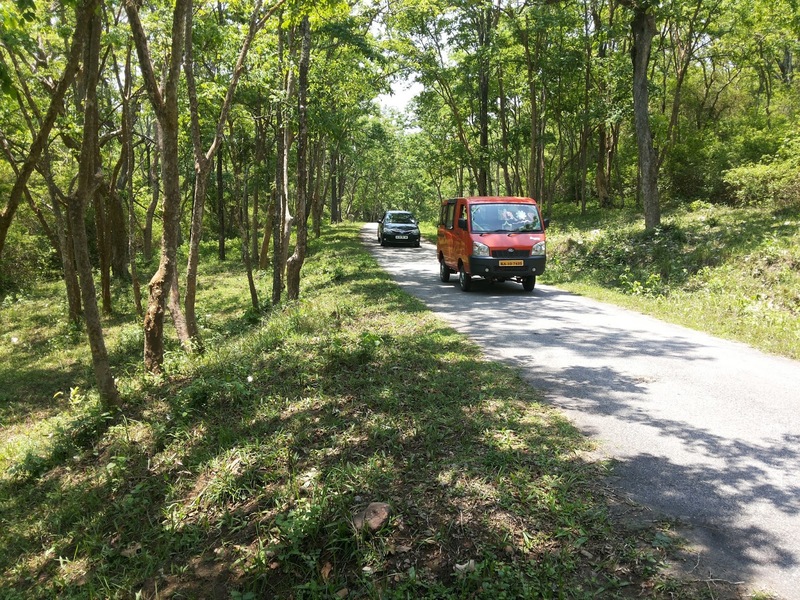 The forest guard asked us the reason and we repeated “going to Chamrajnagar due to some urgent work” as suggested by shopwala. He warned about the wild elephant. 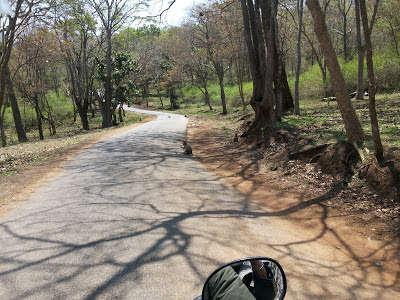 Morning ride was really very beautiful and the nature turned up so lovely. Birds whispering made special effects. Drove almost 4-5 km and we were talking about our unlucky. Luckily we find the 3-4 gour, deer, plenty of peacocks. Thanked to nature at least we could able to see something and our visit was not waste. Reached back BR Hills around 8.30 am and had bisibelebhat in the breakfast and left to Kollegala. The bike trip had two reasons. 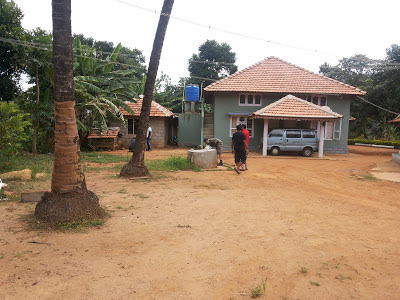 One is experience Splendor for long ride and attends relative marriage at Kollegala. 1. 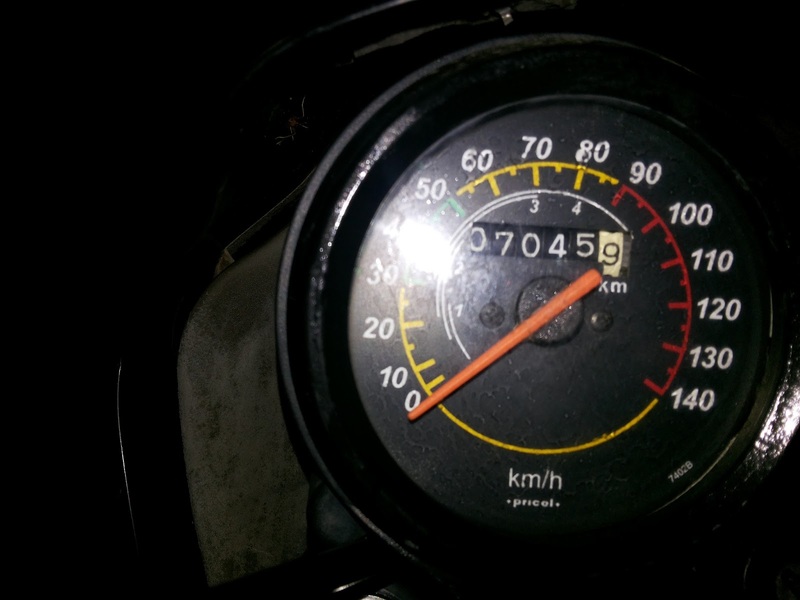 Total from and to journey was 560kms.